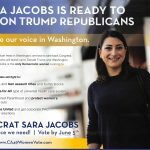 This committee is a Candidate Committee in favor of Sara Jacobs. The committee ID is C00660837 . This entry was posted on May 28, 2018 by administrator. Disclaimer: The publication of promotional material on this site is for voter information and journalistic purposes ONLY does NOT constitute endorsement or support for any candidate/campaign/measure. 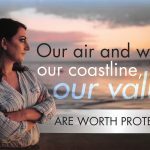 Any valid promotional piece, from any campaign committee, distributed to voters via canvassing, US mail, radio or television that is submitted to this site will be published.